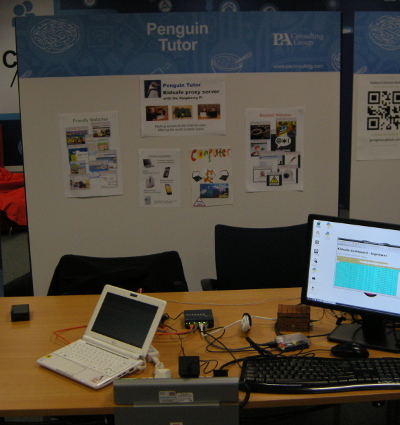 During last year I entered into the PA Consulting Raspberry Pi competition. The aim to "Make the world a better place" using the Raspberry Pi computer. My entry was the Kidsafe family Internet filter proxy. I reached the final which was held last week. I had a great day meeting the staff at PA Consulting and a few familiar names, in particular Clive Beale from the Raspberry Pi Foundation. I had already had the idea to create my own filter to protect my own children on the Internet and to protect my own bank balance from App purchases. I decided this needed to be a dedicated server so that it could filter traffic from my daughters tablet as well as PCs but the cost of a dedicated PC (in terms of always on power as well as purchase price) would have been high. With the availability of a low cost, low power computer in the form of the Raspberry Pi I decided that this could be a viable solution. This was something I was considering when I first heard about the competition and so was a good fit. I had an initial version working quite quickly, but after initial testing decided that the technique used was too limited. I therefore started again using a more sophisticated back-end and a much more ambitious design. I realised that this was going to be difficult to meet the timescales of the competition I'd entered it in, but had the initial release and introductory video created just in time for the closing date for the competition. I then continued to work on the project, fixing some critical bugs and managing to get the dashboard in the week prior to the final. On the day of the final I setup a demonstration environment (using two additional Pis as webservers) and gave a 5 minute demonstration to the judges. The biggest challenge on the day was how to explain several months worth of work into a 5 minute demonstration. There were some difficult questions from the judges which certainly got me thinking and I am going to incorporate some of those ideas into a future version. Essentially whilst I've been thinking about ways to make the proxy easier to install and ensuring that you don't have to install anything on the clients, I think I also need to look at ways of making the clients easier to configure. Perhaps this could be achieved using a client side configuration app which would be optional so as not to require anything to be installed on the client (although perhaps a challenge getting it on a IPad due to the app store requirements). Whilst the rest of the judging was going on we had a tour of some of the facilities at PA Consulting. The engineering section was fascinating, it would be many a hobbyists dream to have access to some of the machines they had including a colour 3D printer and a Stereo-lithography machine. I also got a chance to look around some of the school entries which is more about what the Raspberry Pi is all about. They had clearly put a lot of time and effort into the projects. One thing that was evident was that most of these were entries from private schools and was mentioned in a blog post from Rory Cellan-Jones (Technology correspondent for the BBC and one of the Judges) The life of Pi - clever ideas with a tiny computer. One thing I will say is that there had clearly been a huge amount of time and effort gone into the projects that made it to the final which may have restricted the number of schools. I later spoke with Clive Beale whose job, as Director of Educational Development for the Raspberry Pi Foundation, is to look at ways that children from all walks of life can get involved in programming computers. I've already started to teach my daughter Scratch and was interested in ways that I and others like me could be involved. After talking to Clive I'm now looking at applying to become a STEM Ambassador and hopefully passing some of this on to other children. At the end the winners were announced and unfortunately my project didn't win, although I did get a Raspberry Pi and case as a runner up prize (my 6th Raspberry Pi). There were some great projects and a great deal of credit goes to the winners. I had a great time at the competition. I still think it's early days for the Raspberry Pi at the moment, but now appreciate even more what the aims of the foundation are and hopefully in the future I can help in some way with getting children excited about technology and learning computer science.